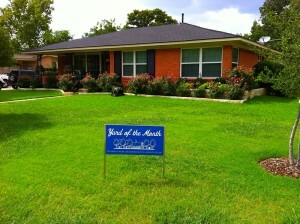 The winner for July Yard of the Month is Glenda Taylor at 700 Ridgedale. They have done an amazing job transforming their yard into a rose bush oasis. Be sure to check it out. Let’s have a strong presence from HPNA! What’s your vision for downtown Richardson and the Central Expressway Corridor? We’ve got some great things happening along Belt Line near our neighborhood….Quik Trip, a new Alamo Theater coming to the Richardson Heights Shopping Center, in addition to some other quality tenants investigating the shopping center. The City of Richardson is now looking at how we can redevelop the downtown area of Richardson and the Central Expressway Corridor. All of this redevelopment can and will help our property values remain strong and increase over the next few years. Have you seen the number of homes in our area currently undergoing renovation? This is a sign that our residents feel confidence in our neighborhood and in the surrounding areas. If you want your property values to increase and your neighborhood to continue to be a quality place to live — a neighborhood that you’re proud to call home — then come and get involved in the Main Street/Central Expressway Corridor Study that the City of Richardson is conducting. Information about this study is in the next section. Read about it and sign up to attend. This is your chance to be involved and make this area the best it can be. It’s money in your pocket. The City of Richardson needs your help to create a strategy for redevelopment and revitalization of Main Street and the Central Expressway Corridor – Richardson’s original downtown and the major access route to the community, its business areas and neighborhoods. The City will host an Open House on Tuesday, July 10, 2012, to begin the public discussion of the future of the Corridor. Ideas and recommendations from persons interested in the study area will contribute to a successful vision and action plan for an improved Main Street/Central Expressway Corridor. Tuesday, July 10, 2012, from 6:30 p.m. to 9:15 p.m. The study area is approximately 415 acres in size, including the Central Expressway Corridor from generally the southern city limit to Arapaho Road, and the City’s historic downtown and the surrounding area. Both were identified for further study in the 2009 Comprehensive Plan. At the Open House, participants will discuss and prioritize issues for the Corridor, imagine a preferred future for the area, and identify action items for advancing study goals. The Open House will be structured around a series of topics at various stations in the meeting room. Participants will be able to stop by any or all of the stations to provide comment. The meeting is designed so that participants can come and go at their convenience, visiting the stations before and/or after the presentation, which is scheduled at 7:20. So that there are enough seats and materials for everyone, please confirm your attendance at the Open House by email at MainCentralStudy@cor.gov or by contacting Monica Heid, Community Projects Manager, City of Richardson, at 972-744-4243. Persons in need of translation assistance may request this service up to five days in advance of the Open House by specifying the language for translation when confirming their attendance. Don’t forget to mark your calendars for our next neighborhood General Meeting, Thursday, July 19th. We’ve arranged for an arborist to visit and discuss the care of one of our best neighborhood assets — our trees. Even though we’ve come through a significant drought, we still need to know about how to care for our trees: How much water do they need? What do we look for in a distressed tree? How do we prune them properly? When is it time to remove a tree? We’ll also have a neighborhood update. Don’t miss this informative meeting.